Officials said they were still investigating the cause of a fire that engulfed Sejong Hospital in Miryang, South Korea, that killed at least 41 people. SEOUL, South Korea — A fire at a hospital that doubled as a nursing home killed at least 41 people on Friday in the southern city of Miryang, the latest in a string of tragedies that have heightened public concern over the country’s safety standards. 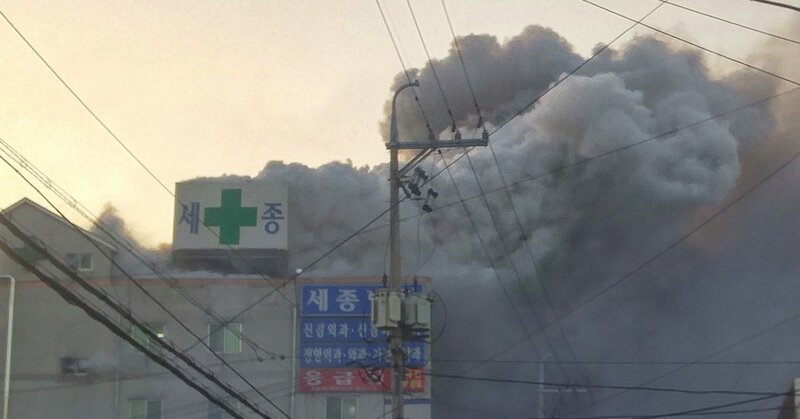 Officials said they were still investigating the cause of the fire that engulfed Sejong Hospital with flames and thick smoke. The fire, they said, erupted in the hospital’s main building. Firefighters and hospital workers evacuated patients from an annex that operated as a nursing home, carrying some of them on their backs. Fire officials said more than 70 people were injured, a number of them seriously. President Moon Jae-in convened an emergency staff meeting in response to the fire. Shortly after the blaze was reported, the country’s prime minister, Lee Nak-yon, ordered his government to send “all available equipment and personnel” to Miryang. Rescue workers removed the bodies of victims after a fire at a hospital in Miryang, South Korea. At least 100 patients were believed to have been in the main hospital building, and 94 in the nursing home annex. At least 100 patients were believed to have been in the main hospital building, and 94 in the nursing home annex. The identities of those who died were not immediately known. In South Korea, a country with one of the world’s fastest-aging populations, the lack of safety measures at its growing number of nursing homes has become a major issue in recent years.